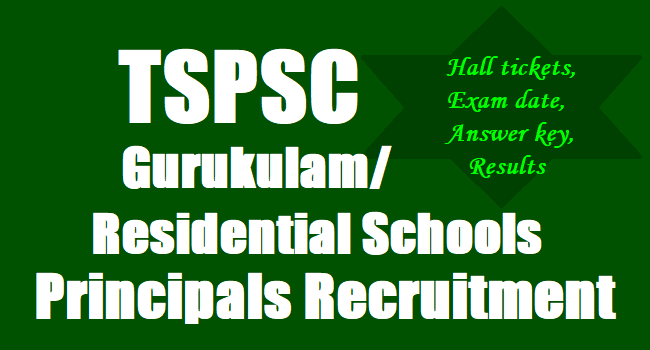 TSPSC RS Principals Results, Certification Verification Dates, list of documents 2018: TSPSC RS Principals Recruitment 2017 Hall tickets, Answer key, Results, TSPSC Residential School Principals Recruitment 2017 Online application form, RS Principals, TSPSC Residential Schools/Gurukulam Principals Recruitment, TSPSC REIS Residential Schools/Gurukulam Principals Recruitment Online application form, Eligibility criteria for TSPSC Residential Schools/Gurukulam Principals Recruitment, TSPSC Residential Schools/Gurukulam Principals Recruitment Hall tickets, TSPSC Residential Schools/Gurukulam Principals Recruitment Results, TSPSC Residential Schools/Gurukulam Principals Recruitment exam Answer key,Preliminary key, FInal Key, TSPSC Residential Schools/Gurukulam Principals Recruitment Preliminary Exam date, TSPSC Residential Schools/Gurukulam Principals Recruitment Main Exam Date, TSPSC Residential Schools/Gurukulam Principals Recruitment Exam pattern, TSPSC Residential Schools/Gurukulam Principals Recruitment Syllabus and more details available on TSPSC Web portal.Principal (school) in residential educational institutions societies. గురుకుల ప్రిన్సిపాల్స్ అభ్యర్థుల ధ్రువపత్రాల పరిశీలన షెడ్యూల్: గురుకుల పాఠశాలలు, కళాశాలల ప్రిన్సిపాళ్ల పరీక్షకు హాజరైన అభ్యర్థుల ధ్రువపత్రాల పరిశీలన షెడ్యూల్‌ను టీఎస్‌పీఎస్సీ చేసింది. ఈ నెల 25వ తేదీ నుంచి 29వ తేదీ వరకు సాంకేతిక విద్యాభవన్‌లో 1,421 మంది గురుకుల పాఠశాల అభ్యర్థుల ధ్రువపత్రాల పరిశీలన చేపట్టనున్నట్టు వెల్లడించింది. జూనియర్ కాలేజీ ప్రిన్సిపాళ్ల అభ్యర్థుల ధ్రువపత్రాల పరిశీలన ఈ నెల 20న టీఎస్‌పీఎస్సీ కార్యాలయంలో నిర్వహిస్తుంది. టీఎస్‌పీఎస్సీ వెబ్‌సైట్లో పొందుపరిచిన మార్గదర్శకాల ప్రకారం అభ్యర్థులు ధ్రువపత్రాల పరిశీలన ప్రక్రియకు హాజరుకావాలి. Venue: TSPSC Office, Nampally, hyderabad. In order to avoid multiple phases of Certificate Verification, the Commission decided to conduct certificate verification for all the qualified Candidates as the number of candidates is not large. Therefore the candidates with the following Hall Ticket Numbers who have qualified in the main examination are called for verification of certificates. As per the above table The candidates who are called for Verification of Certificates have to produce the following certificates in original along with a set of Photostat copies duly attested by Gazzetted Officer at the time of Verification of Certificates, failing which, they will NOT be admitted in subsequent process of selection . No request will be entertained for subsequent submission of any of the required certificates. In terms of the Notification, the candidate should possess the requisite qualifications as on the date of the Notification. The Commission reserves right to disqualify any candidate, if he/she is not found eligible for any reason at any stage. Admission to Verification of Certificates does not confer ipso facto any right for Final selection. 9. Disability Certificate (SADAREM Certificate) in case of PH candidates. The PH candidates have to under go a medical examination at respective Medical Board. TSPSC has conducted written examination for the TSPSC RS Principals Recruitment 2018 notification on 15-05-2018 and 16-05-2018. The preliminary keys of this examination will be avaialable on TSPSC Website from July 7. The objections on the preliminary key will be accepted online on TSPSC Website from 09-07-2018 to 15-07-2018. Candidates are advised to note the above dates and submission their objections only through the link provided. i) A Second Class Master’s Degree (M.A/M.Sc/M.Com) or its equivalent from an institution recognized by the UGC, in the relevant (Annexure-A) school subjects for which the Post Graduate Teachers (PGT) are eligible with not less than 50% of marks in aggregate or its equivalent. iii) A B.Ed. or equivalent degree from an institution recognized by the NCTE with the Teaching Methodology in the concerned subject. iv) A total teaching experience of not less than (8) years including not less than (5) years as PGT/J.L. in any Government / Aided/Government recognized High School/ Junior College and (3) years of administrative experience as Head Master/ Principal of Government / Aided / Government recognized High School/ Junior College. C.
3 Principal (School) in Mahatama Jothiba Phule Telangana Backward Classes Welfare Residential Educational Institutions Society. 4 Principal (School) in Telangana Minorities Welfare Residential Educational Institutions Society. 5 Principal (School) in Telangana Tribal Welfare Residential Educational Institutions Society. NOTE: The question paper of Preliminary (Screening Test) and the question paper of Main examination will be supplied in English version only. The Main Examination (Objective Type) is likely to be held on ..... The Commission reserves the right to conduct the Examination either COMPUTER BASED RECRUITMENT TEST (CBRT) or OFFLINE OMR based Examination of objective type. The candidates who applied for the posts of Degree College Lecturers (Notfn. No.22/2017),Physical Director in Degree Colleges (Notfn. No 23/2017), Librarian in Degree Colleges (Notfn. No 24/2017), Principals in Junior Colleges (Notfn. No 25/2017), Physical Director in Junior Colleges (Notfn. No 26/2017), Junior Lecturers (Notfn. No 27/2017), Librarian in Junior Colleges (Notfn. No 28/2017) and Principal Schools (Notfn.No 29/2017) are hereby informed that, the Preliminary Examination (Screening Test) is rescheduled to ..... due to Bonalu festival in Hyderabad. NOTE: The Main Examinations for Languages in PGT which were scheduled on 27/08/2017 & 28/08/2017 and in TGT which were scheduled on 03/09/2017 & 04/09/2017 remain the same and the candidates can download the Hall Tickets from 21/08/2017 and 28/08/2017 respectively.